The landscape maintenance task that is practically synonymous with fall is raking leaves off the lawn (or blowing them off with power equipment). Aesthetics aside, this chore is necessary, since a thick layer of leaves left on top of your lawn over the winter could smother the grass below. If you will be saving the leaves you rake to make compost or mulch for next year's landscaping, it is important to be clear in your mind about which of those by-products of raking you're aiming for before you rake your leaves. Making compost can be a lot of work. You can't just throw leaves into a pile and expect them to transform into a wondrous black humus ripe for next year's landscaping needs. The ingredients (consisting of "brown" material such as dried leaves and "green" material such as kitchen scraps) in a compost bin should be properly mixed and watered, and the layers of the pile need to be swapped around in a process called "turning over" the pile. Leaves will decompose into compost more quickly if they are shredded before being placed in a compost bin. 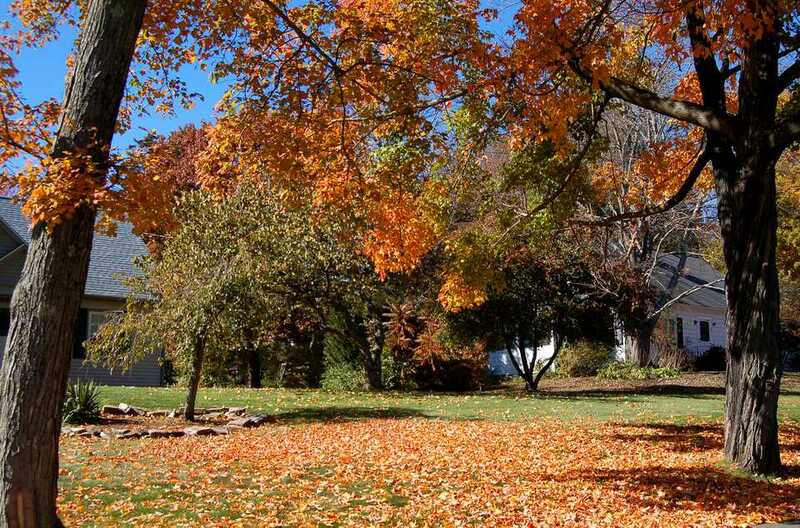 Leaves can be shredded simply by running a mulching lawn mower over them. Let the leaves dry out first because dried leaves shred more easily than wet leaves. Once thorough decomposition is achieved, the compost still needs to be housed in a bin of some sort, to protect it from the elements that would rob it of its hard-won nutrients. Beginners often confuse compost and mulch. The confusion is understandable since mulch eventually breaks down and becomes a compost-like substance in its own right. But, although compost and mulch are related, they are nonetheless distinct and serve two different functions. Organic matter can function as "compost" only after it has thoroughly decomposed, enabling it to release nutrients into the soil. But when leaves are to be used as a mulch, they should not be thoroughly decomposed. A mulch serves not only as a weed suppressor but also as a barrier between your soil and the heat, cold, and wind from which you want to protect it. The mulch barrier lies exposed on the soil surface so that your soil doesn't have to. When leaves have thoroughly decomposed, they're less effective as such a barrier. It is somewhat wasteful to employ decomposed leaves in such a manner since the nutrients they harbor should be protected for use underground (by plant roots), not exposed to the elements. It simply makes more sense to let non-decomposed materials do the rough-and-tumble work of serving as barriers. Consequently, leaves that you'll be using for mulch should not be tossed into a compost bin, but kept in a separate "mulch bin" of their own. Like their compost-bin counterparts, however, it's best to shred the leaves destined for the mulch bin. Unshredded leaves pack down and prevent air and moisture from reaching your soil, causing anaerobic action (fermenting) that you want to avoid. Shredded leaf mulch has less of a tendency to pack down. It takes a while to turn leaves into compost, but leaf mulch is ready to be used as soon as you shred it. Leaves in a mulch bin will be treated differently from leaves in a compost bin. For mulch, a bin is merely a protective holding tank. Unlike the contents of a compost bin, you are not trying to hasten the decomposition of the leaves in a mulch bin. On the contrary, you'd prefer them not to decompose. For, once they decompose, they're no longer mulch: They're compost. And, as compost, they can no longer carry out one of the main purposes of mulch, which is to suppress weeds. In fact, weeds will grow more vigorously if given a layer of compost in which to root, thereby defeating the purpose. Perhaps no other point so clearly highlights the difference between compost and mulch. Therefore, unlike with a compost bin, where you are adding water to help break down the contents, with a mulch bin, you are doing just the opposite: trying to keep the contents dry to preserve them. Here's another difference: You won't be mixing other materials into your mulch bin (leaves only! ).